Iginla isn't going to play forever. He will sign a 2-3 year deal with Calgary in the offseason and retire a Flame. I wouldnt give up Kennedy a 1st and a prospect for a guy who is a true playoff rental. My whole post was about a situation we aren't talking about because it's unknown. Because it's not really being considered. Because it hasn't happened. mikey287 wrote: The Pens gave up a 3rd for Guerin because at 2:55 a deal fell through with another club and the Isles were desperate to get something out of him. IIRC, it was a 5th that became a 3rd because we won the Cup. Another atypical deal, ala Gaustad. Also bears mentioning that Guerin was dogging it on the Island. He didn't have much value. The Pens took a chance on him because they needed a shot in the arm, and it turned out Guerin had something left. They tried somethig similar with Poni the next year and it didn't work so well. Iginla's numbers aren't great but no one seems to think he's slacking. I don't necessarily want Shero to give up everything to get him, though I do think he should do everything he can to maximize this team's chances of winning it all. At the very least the Pens should be in on Iginla just to drive up the price. If Boston's willing to significantly overpay for him, so be it. I'll be upset if the asking price ends up being reasonable and the Pens didn't want to pay. We're going for the cup people...Pens could easily absorb losing Doumoulin with the depth we have in the system. We would need a bottom 6 replacement for Kennedy. Pull a random stranger who knows how to skate off the street. There's your replacement. Seriously, it's not that hard to find guys to play on the 3rd line, especially ones that don't have any sort of special skill (and no, shooting every time you get within 50 feet of the goalie is not a special skill). It's hard to find top-6 wingers with complete games. The point is, I wouldn't put together a Hossa type package for Iginla given his uncertainty. I'd rather go the Guerin route and toss a 3rd round / 4th round, ect. to get a character guy. Kicksave is still on the waiver wire. columbia wrote: Kicksave is still on the waiver wire. I don't think we're talking Hossa package. I think we're talking like Maatta and a 1st. I'm not gonna about the Hossa package in retrospect, because that's not fair. You had a 3rd liner in Colby Armstrong, that some thought could be a complimentary 2nd line scoring winger. You had an offensive guy with a great shot in Christensen that hadn't found his way, he's a tough guy to use, but he's worth a look...Esposito was supposed to be a top pick and while his value is sliding, he's still considered a prospect with good upside. He'll need a winger that can cash ("we have that in Kovalchuk"). And then a late first is a late first. Here, we're talking about Maatta, who is a good prospect, I'd struggle to make a comparison in value between him and Esposito circa the Hossa deal though. I just can't wrap my head around it. It would vary from team to team for sure though. And then a late first. Anything more than that is another thing entirely in my opinion. I'm not sure a 4th round pick is gonna get you a Guerin or character guy. Who are we talking about here for a 4th round pick? Where is this cap space going to come from, under the scenario of Iginla "re-signing" for a few more years with the Pens? My scenario (albeit a longshot) is one year on the cheap. Like 1 year, $5 million-ish. As he knows he's getting a retirement contract from Calgary after that, plus likely a job in the front office if he wants it. Also, it should be mentioned that if the Pens do trade their 1st round pick it will be a mid-to-late pick in the round. You can certainly find talent there but it's not a top-10 pick or anything. This is the first time I opened this thread and I'm shocked to find out Maata and a 1st is in the ballpark for Iginla. If that's the deal I would do that in a heartbeat. I always thought it would be Despres/Bennett, Maata, and a 1st just to get talking. Nice to see the price has come down since January. Staggy wrote: This is the first time I opened this thread and I'm shocked to find out Maata and a 1st is in the ballpark for Iginla. If that's the deal I would do that in a heartbeat. I always thought it would be Despres/Bennett, Maata, and a 1st just to get talking. Nice to see the price has come down since January. The only way Shero is dealing for Iginla is if his price comes way down...why trade Kennedy+Maata+1st for Iggy if that could get you an asset with much better long-term value...this season is strange in that the Penguins have an abnormal amount of cap space and other teams are looking to unload some salary for next year. I'm not sure of the rules on this, but could the Penguins theoretically trade for a guy with a "bad" contract (hence giving up less) say for a guy like Stastny/Briere etc. and then use one of their buyouts on him? Really? The most I'd be willing to give is Kennedy and a 2nd. DontToewsMeBro wrote: The only way Shero is dealing for Iginla is if his price comes way down...why trade Kennedy+Maata+1st for Iggy if that could get you an asset with much better long-term value...this season is strange in that the Penguins have an abnormal amount of cap space and other teams are looking to unload some salary for next year. I'm not sure of the rules on this, but could the Penguins theoretically trade for a guy with a "bad" contract (hence giving up less) say for a guy like Stastny/Briere etc. and then use one of their buyouts on him? We dont have all that much room especially if the cap is down to 64M next year. We actually don't need to do that, because we still have Dupuis to move down to the third line. Thing is, do you really want to break up that group right now, even for Iginla? They're a well oiled machine. I'd rather go get a banger who can chip in a couple goals and improve the penalty kill for the 3rd line. Cooke, Sutter and Kennedy are all fine players, but this mix isn't doing it for me. Cooke and Sutter are fixtures on the PK, so that makes TK the odd man out. Id also be OK with replacing Glass, but again, it needs to be for a banger who can cycle and kill penalties, which is what Glass is supposed to be. Komisarek on waivers!? What do you think of him? Last 2 seasons I think he declined..
Haha...totally unrelated, but check out Grabner's face on the penguins.com front page for the "what to watch for" article." 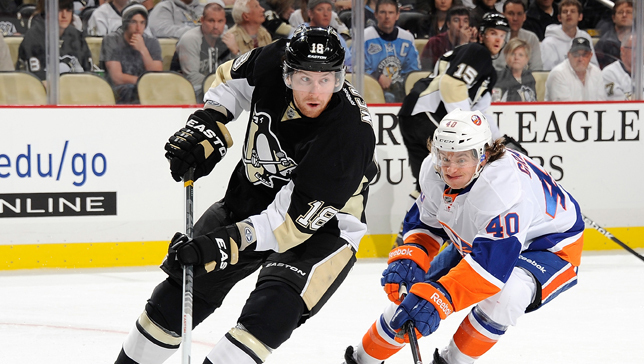 sil wrote: Haha...totally unrelated, but check out Grabner's face on the penguins.com front page for the "what to watch for" article." Hence why he said use a buyout on him in the offseason so there is no cap hit. I've said it numerous times, what so many people on this board fail to realize is that you still have to pay those players real money, 2/3rds of their remaining salary, and the Pens, while a "cap team", are not a "rich team." To buy out Stastny would be around 4million and Briere (not that Philly would ever ever evvvvverrrrrrr trade him to us) would be twice that. For a team that claims to have to make the 2nd round to turn a meaningful profit, that ain't chump change. Good for him for breaking out of that year plus slump. As good as Bennett has been on the 2nd line LW would the team be better if we were to get Prospal for that LW spot and then move Bennett down with Cooke and Sutter and then somehow upgrade Glass with (please) Matt Hendricks? Bennett has definitely proved himself but he also plays such a strong defensive game and in the playoffs we will need a 3rd line that can score. Bennett-Sutter-Cooke has all the parts to be hard to play agaisnt, strong defensively and all three have skill to make goals happen. Of course Columbus being in a playoff race right now and also playing well should stop them from dealing Prospal and looking around at other players better than Bennett, because moving Dupuis down would be stupid, Morrow would also be a good fit on Malkin's wing. Wow, that's the same face my son used to make when filling his diaper.